Dianne Feinstein is a Democratic member of the United States Senate, representing California. She was originally elected to the Senate in 1992. Senator Feinstein is a member of the Senate Judiciary Committee and the Senate Appropriations Committee, where she chairs the Subcommittee on Energy and Water. Senator Feinstein also serves on the Senate Rules and Administration Committee, which she chaired during the 110th Congress. In that capacity, Senator Feinstein was the first woman to chair the Joint Congressional Committee on Inaugural Ceremonies, and presided over the Inauguration of President Barack Obama on January 20, 2009. Dianne Feinstein was born in San Francisco, California, on June 22, 1933, to a Jewish physician father, Leon Goldman, and a Catholic Russian-American mother, Betty Rosenburg Goldman. Feinstein had a tumultuous childhood. Her mother a former model, was prone to violent, alcohol-fueled rages, frequently directed at Feinstein and her two younger sisters, Lynn Goldman and Yvonne Goldman. “The smallest thing could set her off,” Feinstein later recalled. “You could not reason with her.” The burden of managing Betty’s eruptions fell to Dianne and her father, Leon Goldman, a gifted physician who was the first Jewish chair of surgery at the medical school at UCSF. Feinstein attended the Convent of the Sacred Heart, an exclusive and highly regimented Catholic school for girls, where she learned discipline and developed an interest in acting. Feinstein was introduced to politics by an uncle who began taking her to San Francisco Board of Supervisors (city council) meetings when she was sixteen. She recalled later that this was the main factor in her decision to pursue a career in public service. After graduating from San Francisco's Sacred Heart High School, she attended Stanford University. She studied history and political science and was also active in student government. She received her bachelor's degree in 1955. In 1956 Feinstein married Jack K. Berman, a man who would eventually become a San Francisco superior court judge. The couple had one daughter. Combining marriage and family with a career, Feinstein was employed by a public affairs group that was interested in criminal justice. She went on to work for California's Industrial Welfare Commission and was appointed in 1962 to a four-year term on the state's Women's Board of Paroles. When her first marriage ended in divorce, she withdrew from public life for a time but came back as a member of San Francisco's Mayor's Commission on Crime. Before her career in the Senate, Feinstein was the President of the San Francisco Board of Supervisors, elected in 1969 for 2.5 terms, and the Mayor of San Francisco, beginning in 1978 for 8 years. She is a San Francisco native. .
From her first months at Stanford, Feinstein sought ways to make her mark. She put herself forward for a position as a freshman representative on the Associated Students’ executive committee and ran for secretary of the Associated Women Students. By the start of her senior year, Feinstein had become politically active. She’d been overseas for the first time, Before her senior year, Dianne Goldman, as she was then known, travelled to Europe on a 1954 student trip led by Stanford political science professor, James T. Watkins. The agenda included a possible meeting with Yugoslav communist revolutionary Marshal Josip Broz Tito. In 1954 Dianne Goldman stood for, and won, the position of ASSU vive - president. After a record turnout, she won 63 percent of the vote. Left to right are ASSU vice-presidential candidates Dianne Goldman, Ann Irvine, and Maureen Maxwell. In a vigorous verbal session, Stanford Excom sustained last week's decision to endorse a movement to bring Soviet student newspaper editors to this country for "guided tours." By a vote of 8 to 5, Excom members defeated a motion to rescind their former decision. In favor of the motion to rescind were Jack Tracy, Sally Beel, Carol Gevurtz, Roberta Clark, and Jim Flanagan. Opposed to the motion were Sam Palmer, Jon Cosovich, Don Peck, Dave Brownwood, Dianne Goldman, Betty Bigelow, Bob Bowden, and Steve Voykovich. In his re-introduction of the subject, Pete Bing pointed out that, at the National Students Association summer conference, a subcommittee voted down a resolution which favored bringing the Russian student, editors to the United States. This resolution had been brought to the plenary floor of the convention as a minority resolution, and defeated by a vote of 235 to (50. Both Bing and Bob Gable suggested that Stanford write to the State Department and ask for their reasons for delaying entrance permits. Speaking in favor of endorsing the movement, Sam Palmer asserted that "nothing can be lost in allowing them to tome over." He was supported by both Dianne Goldman and Don Peck, who claimed that it was important to show' Russia that the United States is not an Iron Curtain country- that we arc willing to let Communists enter. "The visitors can't help but leant, see, and talk," stated Pat King. "They will get impressions and memories of the United States that nothing will be able to erase, even | though they might be unable to write about these facts once they return to Russia." Steve Voykovich asserted that such a visit would bo harmless to the United States, and underlined the need for co-existence in the world of today. He felt that bringing in the Russian visitors would be a step in the right direction. A later motion by Dianne Goldman requesting Bing to write the State Department for further information on the matter was defeated. Goldman hosted Soviet journalists visiting campus on an exchange program and was a frequent speaker at events held by the Stanford Political Union, a group that convened policy discussions with prominent public officials. During one forum on California’s regulation of alcohol sales, she delivered the student rebuttal to remarks made by a conservative state legislator named Caspar Weinberger, who would later become the U.S. secretary of defense. Seven Russian journalists visited the Stanford campus in October 1955 as part of their month-long tour of the United States. Arriving in New York on Oct. 17 the delegation visited that city, Chicago and Cleveland. According to Boris Nikolaevich Kanpov-Polevoy, secretary of the governing board of the Union of Soviet Writers and spokesman for the group, the purpose of journalists' visit is to "see in America everything worth seeing—the best of things." In 1956, she married Jack K. Berman (died 2002), a colleague in the San Francisco District Attorney's office. Feinstein and Berman divorced three years later. Their daughter, Katherine Feinstein Mariano (b. 1957), is a Superior Court judge in San Francisco. In 1962, shortly after beginning her career in politics, Feinstein married neurosurgeon Bertram Feinstein; her second husband died of colon cancer in 1978. In 1980, Feinstein married Richard C. Blum, an investment banker. When Phillip Burton returned to San Francisco in 1947 he worked for Time Oil in Richmond. There he met a young Democratic activist and former Communist Party USA member named Bert Coffey, a close associate of George Miller, Jr. a young California Assemblyman. This group of young Democratic insurgents joined up with Joe Holsinger, Yori Wada, Jack K. Berman, a liberal lawyer and the first husband of Dianne Goldman (Dianne Feinstein), and Dr. Carlton Goodlett, a black physician, publisher and longtime Communist Party USA activist. Burton and Goodlett worked closely together in the NAACP and the Young Democrats. Future San Francisco Mayor and long time Communist Party USA ally Willie Brown came into the public eye through a well planned incident. Dec. 20 1973 the San Francisco Board of Supervisors unanimously approves a non-binding resolution urging the S.F. Retirement System Board to divest, proposed by Supervisors Quentin Kopp, Dianne Feinstein and Terry Francois. Califormia Senator Dianne Feinstein has links to Fidel Castro's Cuba. Feinstein is married to investment banker Richard C. Blum. ASTAR Airlines was fined in 2004 for making payments to a Cuban government entity for DHL Airlines, of which Blum is s a 33% owner. Blum was a board member during the ASTAR payment-to-Cuba time frame. Although this information was revealed in the Washington Tariff & Trade Letter, Vol. 24, No 14, on April 5, 2004, it never made the news. Indeed, ASTAR Air Cargo was fined $28,073 for making payments to a Cuban government entity. In 1985, while serving as mayor of San Francisco, Dianne Feinstein issued a proclamation in support of that year's World Festival of Youth and Students, in Moscow. The event was organized by the Soviet front World Federation of Democratic Youth, and was supported locally by the Communist Party USA and similar groups. The president of a U.S.-Soviet trade council meeting in Moscow December 1985, contended December 9 that Washington's efforts to alter policies in Moscow through trade restrictions should give way to a more positive approach. "Many of us are asking whether we have used the stick long enough and whether we should start to use the carrot. After all, 10 years [of restrictions] have not got us much," said President James Giffen of the nongovernmental U.S.-U.S.S.R. Trade and Economic Council at a press conference. A large and high-powered contingent of U.S. businessmen is here for the meeting that both Americans and Soviets are calling the first major spinoff of last month's summit meeting. Secretary of Commerce Malcolm Baldrige accompanied 450 American businessmen and officials. "I can only think that the Geneva summit had something to do with" the increased interest, said Giffen, adding that at the last meeting, in 1982, only 250 Americans attended. Echoing the same theme, the Communist Party newspaper Pravda made a direct link between the summit and improved trade relations, which, it said, create the "material fabric . . . for building up an atmosphere of trust." The trade council has been critical of various official U.S. restrictions placed on Soviet trade, which its spokesmen say have only hurt American business in an increasingly competitive market. Total trade between the two countries jumped dramatically last year to $3.2 billion, but the upsurge was due to shipments of American grain. In nonagricultural areas, trade has fallen off since the deterioriation of relations in the late 1970s. General Electric, IBM and Du Pont are among companies represented at the meeting. A chartered Boeing 747 jet that arrived yesterday with the businessmen and Baldrige also brought San Francisco Mayor Dianne Feinstein and former ambassador Robert Strauss. According to trade council officials, the number of businessmen interested in the meeting increased markedly after President Reagan met with Soviet leader Mikhail Gorbachev in Geneva last month. Baldrige's attendance was not confirmed until after Geneva, they said. Giffen said it was likely that American companies would participate in new Soviet energy projects -- in the Barents Sea among other sites -- in exchange for energy exports, serving to rectify the current trade imbalance in favor of the United States. Giffen noted that the Soviets still doubt the reliability of American traders since, in the Soviet view, the 1985 U.S. export act did not foreclose the kind of trade embargoes that have been applied in the past. On January 27, 1987, Soviet Consul General Valentin Kamenev presented San Francisco mayor Dianne Feinstein with a Soviet streetcar "a streetcar named desire". Also present were Vitali Vertsov, trolley car chief in the Soviet city of Orel, and Viktor Zhelezny, deputy chief of public transport Russian Republic. Democratic Socialists of America endorsed Feinstein in her 1990 bid for the California Governorship. In September 1996, the Justice Department and a key House committee began separate investigations into possible CIA connections to a Bay Area drug ring that helped ignite the "crack" cocaine epidemic of the 1980s, widening the federal government's inquiry into the matter. "The integrity of our justice system is at stake," said U.S. Sen. Dianne Feinstein, D- Calif., who announced the Justice Department probe of information uncovered in a Mercury News series, "Dark Alliance." "It is completely unacceptable for the United States to have been involved in any way with the trafficking of drugs over our borders." The Justice Department investigators will cooperate with the CIA's inspector general, who also has launched on a full investigation into allegations that have enraged the Congressional Black Caucus and lighted up switchboards at talk radio stations nationwide for weeks. Rep. Maxine Waters, D-Los Angeles, also released a letter from House Speaker Newt Gingrich, R-Ga., stating that the House intelligence committee would look into the matter, according to the Los Angeles Times. The investigations stem from the Mercury News' three-part series, which detailed how a Bay Area drug ring sold tons of cocaine to the street gangs of South-Central Los Angeles and funneled millions in drug profits to the CIA-backed Contras, who were at war with Nicaragua's left-wing Sandinista government. Traced to dealers The series traced the crack cocaine explosion to two Nicaraguan cocaine dealers, Danilo Blandon and Norwin Meneses, who were civilian leaders of the Frente Democratica Nicaraguense (FDN), an anti-communist commando group formed and run by the CIA during the 1980s. Blandon, who is now an undercover informant for the Drug Enforcement Administration, admitted in federal court recently that his biggest customer was a South-Central crack dealer named "Freeway" Rick Ross, who turned Blandon's cocaine into crack and distributed it to the Crips and Bloods street gangs. Blandon told the DEA in 1995 that at the height of his business with Ross, he was providing 100 kilograms of cocaine a week to the gangs. Feinstein said Michael Bromwich, the Justice Department's inspector general, will look into the DEA informant's testimony. Ex-federal prosecutor Bromwich is a former federal prosecutor who worked in the narcotics unit for New York Mayor Rudolph Giuliani when he was a U.S. attorney. Bromwich also was associate counsel from 1987 to 1989 for the independent counsel investigating the Iran-Contra scandal. "While I am fully aware that these events occurred during the Reagan and Bush administrations, it is unconscionable to let the implication stand that the United States helped introduce the crack cocaine epidemic into the streets of our cities," Feinstein said in a letter to Attorney General Janet Reno, seeking the probe. "The implications are far too deep and the connections far too strong," Feinstein wrote, adding later: "I urge you to dispel these notions by getting to the bottom of these allegations. We must be honest about our past to ensure that our work to stop the flow of drugs in the future may continue without the tarnish of corruption these charges have brought." CIA Director John Deutch ordered the spy agency's inspector general to investigate the report after Sen. Barbara Boxer, D-Calif., and Rep. Maxine Waters called for a probe. Feinstein has been supported by EMILY's List during her campaigning. Transition and new potential were the key words for our Washington, DC operation in 2008.The Foundation decided to concentrate its resources in a new, flexible approach to impacting government policy and legislation – emphasizing rapid responses to issues as they arise. In 2009, the key to our success will be fresh access to key policymakers provided by experienced Washington consultants, which we have engaged to help us with Congressional and Executive Branch outreach. We also plan to continue to grow our Turn the Tide Campaign (see opposite page) so thatindividual voices can directly influence the decision-making process in the U.S. capital. 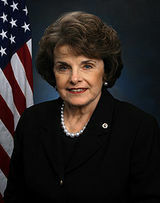 In May 2008, the Nuclear Age Peace Foundation and the Alliance for Nuclear Accountability presented Senator Dianne Feinstein with an award for introducing the Nuclear Policy and Posture Review Act of 2007 (S. 1914), which requires nuclear policy and posture reviews that consider international nuclear disarmament obligations. The bill also calls for public input and declassified versions of the reports. Left to right: Nickolas Roth (Nuclear Age Peace Foundation), Senator Dianne Feinstein, Marie Rietmann (Women’s Action for New Directions), Paul Kawika Martin (Peace Action), Alfred Meyer (Alliance for Nuclear Accountability). Feinstein and her husband, Richard C. Blum, contributed between $500,000 and $999,999 to the Brookings Institution, between July 1, 2008–June 30, 2009. Dianne Feinstein is very close to the Council for a Livable World. The Council for a Livable World, founded in 1962 by long-time socialist activist and alleged Soviet agent, Leo Szilard, is a non-profit advocacy organization that seeks to "reduce the danger of nuclear weapons and increase national security", primarily through supporting progressive, congressional candidates who support their policies. The Council supported Dianne Feinstein in his successful Senate run as candidate for California. Council for a Livable World Peace PAC Chair and former Rep. Patricia Schroeder (D-CO) introduced the Council’s first honoree, Senator Dianne Feinstein (D-CA), a "leader and expert on nuclear weapons issues who is also dedicated to bringing our troops home from Iraq". Sen. Feinstein spoke of the difficulties of fighting eight years of Bush Administration proposals for a succession of new nuclear weapons programs inspired by a terribly misguided Nuclear Posture Review. She mentioned fighting the Robust Nuclear Earth Penetrator (nuclear bunker buster), the Advanced Concept Initiative and the Reliable Replacement Warhead – but winning every year. Feinstein said she is committed to ensuring that the United States does not open the door to greater nuclear proliferation, the central mission of Council for a Livable World. June 27, 2013 the Senate Appropriations Committee marked-up the FY 2014 Energy and Waters Appropriations bill. Because of the efforts and leadership of Senator Dianne Feinstein (D-CA) the committee passed a bill that increases funding to prevent nuclear terrorism while scaling back wasteful spending on the life extension program for the B61 nuclear gravity bomb. The President’s FY 2014 budget request for the National Nuclear Security Administration (NNSA) slashed funding for successful anti-nuclear terrorism and nonproliferation programs including the Global Threat Reduction Initiative, which have removed dangerous nuclear materials from ten countries. While cutting cost-effective non-proliferation programs, the request for the B61 refurbishment rose by forty-five percent above FY2013 appropriations. Two years ago, NNSA estimated the program would cost $4 billion and start in 2017. Today, its estimate has ballooned to over $10 billion and the first refurbished bomb will not be produced until 2020 at the earliest. Harry Bridges was once a secret member of the central Committee of the Communist Party USA. And, as founder and president of the International Longshoremen's and Warehousemen's Union, he worked within the capitalist system that he said he despised to help make West Coast longshoremen among the best paid workers in the world. On February 9 1986, the 84-year-old Bridges, was honored at a testimonial dinner at the Los Angeles Hilton in "a celebration of a life, a movement, an epoch." The sponsors included Los Angeles Mayor Tom Bradley, San Francisco Mayor Dianne Feinstein and more than 150 other political, labor, business and education leaders. The Committee for Harry Bridges Plaza is a 501(c)3 non-profit that first began in 1998 as an ad hoc group of citizens dedicated to the belief that the ideals and deeds of Harry Bridges and the working men and women of 1934 should occupy a prominent position in San Francisco’s civic history and never be forgotten. To that end the Committee took on a two-part plan: First, to have the plaza then under construction in front of the Ferry Building between the north- and south-bound lanes of the Embarcadero named after Harry Bridges, and second, to erect a monument of Harry on the site. The idea quickly gained the enthusiastic support of organized labor, past and present mayors of San Francisco, the Board of Supervisors, the Port Commission, and from elected state and federal representatives. Harry Bridges Plaza officially came into existence on July 27, 1999. The official christening fell on July 28, 2001, Harry’s 100th birthday. The Committee worked with the Mayor of San Francisco and the Governor of California to proclaim the date “Harry Bridges Day.” In celebration, tributes to Harry were read into the Congressional Record by Senator Barbara Boxer and Congresswoman Nancy Pelosi. Endorsers of the project included Senator Dianne Feinstein, Senator Daniel Inouye, Congresswoman Nancy Pelosi Congresswoman Jackie Speier. The more than 5,000 strong Sacramento Progressive Alliance endorsed Dianne Feinstein in 2010. Ending nearly 40 years of trade restrictions with Russia, the Senate voted December 2012 to approve a bill that will allow U.S. companies to expand business ties with the world's ninth-largest economy and its 140 million consumers. The bill to grant permanent normal trade relations to Russia, which passed 92-4, now goes to President Obama, who said that he'll sign it. Businesses lobbied hard for the legislation, saying it would allow them to cash in after Russia formally joined the World Trade Organization on Aug. 22. With passage of the bill, Sen. Max Baucus, D-Mont., chairman of the Senate Finance Committee and a top advocate of the legislation, predicted they will at least double within five years. Sen. John Kerry, chairman of the Senate Foreign Relations Committee, said all U.S. businesses will benefit because Russia now will be forced to lower its tariffs and allow more imports after joining the WTO. Sen. Dianne Feinstein, D-Calif., said the trade deal "includes only concessions by Russia," since the United States is a member of the WTO. Congressional endorsers of the proposal included Dianne Feinstein. In 2013 Progressive Democrats of America assigned activists to deliver their material to almost every US Congressman and Senator, Shirley Golub was assigned as the contact for Senator Feinstein. JStreet endorsed Feinstein in 2016. Feinstein earned a reputation as an authority on international affairs. Recently, she has been a leading voice on the need to prioritize diplomacy to resolve the threat of a nuclear armed Iran. Feinstein is a committed supporter of a two-state solution and strong friend of the pro-Israel, pro-peace movement. Washington, DC – The Iranian-American Bar Association (IABA) launched its Unity Campaign on November 21 2002 with a presentation called "Impact of Pending Immigration Laws and Opportunities for Civic Engagement," a first in an expected series of events aimed at bringing together Iranian-Americans as a formidable, influential force on civic life, as well as facilitating educational panel discussions between Iranian-Americans and non-Iranian Americans. With Shokooh Miry, Senator Dianne Feinstein and Lily Sarafan. Today a team of SF NIAC members delivered a total of +2,000 signatures to Senator Dianne Feinstein's office, on a petition thanking her for her leadership supporting the Iranian nuclear deal. Many thanks to all of you participated in helping us meet our goal! — with Yasmin Radjy, Maryam Ziaei, Jessica Glass, Field Representative for Senator Dianne Feinstein and Ahmad Kiarostami. “Through their continued efforts to educate and introduce Americans to positive aspects of the Muslim community, CAIR-LA provides an important link and resource for the Los Angeles region. Their unwavering dedication to increasing awareness and acceptance is truly praiseworthy.” - Sen. Dianne Feinstein (D-Calif.) (November 2011) . Dianne Feinstein has long ties to the People's Republic of China, and its friends. Scheduled passenger airline service between China and the United States was restored January 8, 1981, after a 32-year hiatus when a Boeing 747 with 139 Chinese passengers arrived exactly on time at San Francisco International Airport. Mayor Dianne Feinstein and Consul General Hu Ding-yi held a ribboncutting ceremony, which included a cake, decorated with CAAC Welcome to San Francisco, and two bottles of champagne. Mayor Feinstein described the landing as an historic and exciting occasion. Consul General Hu said he was delighted and excited and predicted more travel between China and the United States. Senator Dianne Feinstein of California said March 10, 1997 that the Federal Bureau of Investigation had warned her that the Chinese Government might try to funnel illegalcontributions to her campaign and other Congressional campaigns, but she said the information had not influenced her position or her vote on any issue. Ms. Feinstein, a Democrat, said that while "the information was vague and nonspecific," she had concluded that she should "be very cautious" in dealing with Asian-American contributors. At a news conference at Dulles International Airport in suburban Washington, after she had arrived on a flight from San Francisco, the Senator said she had been frustrated because the information from the F.B.I. had been too sketchy to be useful in identifying contributors who might have funneled Chinese money into her campaign. "Was I briefed?" Ms. Feinstein asked. "Yes. Was it a specific briefing? No. It was a classified briefing. The substance of it was that there were some credible sources that presented the F.B.I. with the view that the Chinese may try and funnel contributions to various candidates. That was it. There were no specifics. How would this happen? When would it be done? Where would it be done?" To such questions, she said, she received no answers. Senator Feinstein's statements came after The Washington Post reported today that the F.B.I. had warned six members of Congress that they had been selected by China to receive campaign contributions funneled through foreign corporations. Ms. Feinstein said she did not know the names of the five others. The Senator said she had "no reason to believe" that the Chinese Government had actually contributed to her campaign. "None whatsoever," she said. The disclosures are the latest development in a furor over campaign contributions by Asian-Americans and companies based in Asia. For many years, Ms. Feinstein has tried to promote friendship and trade with China, and she has countered critics of the Chinese human rights record by emphasizing what she described in a Senate speech last year as "major improvements in human rights" there. Republican Congressional leaders said today that they would try to find out what, if anything, the White House had known about Chinese attempts to buy influence in American politics. Leon Panetta, the former White House chief of staff, said today that neither he nor the President had been warned by the F.B.I. Senator John McCain, an Arizona Republican who has introduced legislation to overhaul the financing of campaigns, said the reports about China's effort to buy influence in America would be investigated. "It gives another new twist to this ongoing scandal," he said. "This has to be investigated." Mr. McCain has prodded Attorney General Janet Reno to seek the appointment of an independent counsel to investigate Democratic fund-raising activities. Senator Feinstein was re-elected in 1994, but she said she had still been trying to pay campaign debts last year. She said that on Friday, she had returned six contributions from people with connections to the Lippo Bank, an arm of the Lippo Group, a conglomerate based in Indonesia that has investments and business operations throughout Asia. The contributions, made in 1994, totaled $12,000, she said. Four of the contributions were made by Lippo Bank employees; two were made by wives of bank employees. Ms. Feinstein said she had returned the contributions "only because they became controversial," not because she believed them to be illegal. Federal law prohibits contributions to an election campaign from a foreign government, but Ms. Feinstein said she did not know whether Lippo had connections with the Government of China. "I don't believe anybody knows that," she said. "I don't know what connection Lippo has with the Government of China." Ms. Feinstein's husband, Richard Blum, has extensive investments in China. Her financial disclosure statement shows, for example, that his money-management firm has financial interests in Shanghai Pacific, Golden China and other partnerships that invest in China. But Ms. Feinstein said that her husband's investments had not influenced her position on foreign policy and trade with China. "We have built a firewall," she said. "That firewall has stood us in good stead." President Clinton attended a fund-raising dinner at Senator Feinstein's home in California on June 9, 1996. Among those on the guest list were John Huang, a top fund-raiser for the Democratic National Committee who had been a Deputy Assistant Secretary of Commerce. Mr. Huang was a senior American executive for the Riady family's Lippo Group, a $12 billion conglomerate, before he joined the Clinton Administration in July 1994. He is now the subject of a Justice Department investigation into possibly illegal contributions to the Democratic Party from foreign sources. Also at the dinner was Xiaoming Dai, the chairman of Asia Securities International, an investment company, based in Hong Kong, with an office in Beijing. Lippo had acontrolling stake in Asia Securities but sold it in 1994. A recent annual report from Asia Securities contains a photograph of Mr. Dai with Stephen T. Riady, chairman of Lippo Ltd., who runs the Hong Kong operations of the Lippo group. Ms. Feinstein said that she had recently adopted a policy of not taking campaign contributions from permanent resident aliens, even though they are allowed to make such contributions. "We have changed our procedures and are not accepting contributions from anyone who is not a citizen," she said. Ms. Feinstein said that she now asks all contributors to certify that they are United States citizens and that the money they contribute to her campaign is their own. "This was not thought to be necessary before," she said. "I don't know what else to do, frankly." Ms. Feinstein said that on Monday she would call the Director of the F.B.I., Louis J. Freeh, and ask him for more information about possible Chinese efforts to buy influence with her. "If there is credible evidence," she said, "tell me what it is. Enable me to protect myself. That's the job of the F.B.I." At the meeting last June, she said, none of the F.B.I. agents "told me where or when or how or what to look for." In 1999, things were not looking good for a deal to allow China to join the World Trade Organization. A highly touted visit to Washington by Chinese Prime Minister Zhu Rongji that many expected would cinch an agreement ended in failure. Prospects got gloomier when U.S. bombs accidentally leveled the Chinese Embassy in Belgrade, Yugoslavia, in May. But in this game of high-powered negotiations that ultimately led Monday to a trade deal, the Clinton administration had an ace in the hole: Sen. Dianne Feinstein. The California Democrat had a 14-year personal relationship with Chinese President Jiang Zemin, dating back to the days when Feinstein was mayor of San Francisco an Jiang was mayor of its Chinese sister city, Shanghai. So last August, the White House dispatched Feinstein on yet another trip to China. She carried to Jiang a handwritten note from President Clinton, urging him to resume talks. "Senator Feinstein played a critical role in paving the way for this critical trade agreement," said White House press officer Elizabeth Newman. Feinstein's role in the WTO deal might not be over. As one of the strongest advocates in Congress of economic ties with China, Feinstein could play an important role inhelping persuade senators to grant China the permanent "normal trade relations"status that is critical to the deal. Prospects for approval look promising as key Republican leaders have lined up behind the president. But many in Congress had concerns, among them Rep. Nancy Pelosi, D-San Francisco, and Rep. Tom Campbell. Feinstein said in an interview November 1999 that she felt the only way China would enter into WTO negotiations again was with the backing of Jiang. "Other than him saying go ahead with it, it wasn't going to happen, in my view,"
Feinstein said, offering her services as an intermediary to Clinton and national security adviser Sandy Berger. "I said I'd be prepared to do it if they felt it would be helpful, and they said they did think it would be helpful and please do it." On Aug. 16, in the Chinese coastal city of Dalian, Feinstein delivered the note to her old friend and met with him for three hours in hopes of getting WTO negotiations back on track. Feinstein had visited Jiang several times in China over the years. He once invited her and her husband to see Mao Tse-tung's bedroom in his old residence, the first foreigners to do so. Feinstein had entertained Jiang in San Francisco, dancing with him as he sang "When We Were Young." On that day last August, she found Jiang receptive and particularly pleased that Clinton had taken the time to personally write a note to him. "I think he listened, and we had substantial discussions on the subject," she said. Jiang mentioned that he was concerned that when premier Zhu had come to Washington bearing a proposal that some in his government felt was too favorable to the United States, it was not only rebuffed but publicly denounced, Feinstein said. "I was successful in getting the Chinese interested in beginning to resume negotiations on the subject," she said. But Feinstein said the credit for the agreement goes to U.S. negotiators. Feinstein expected approval of the new trade status, which would remove the annual congressional review that many believe continues to put pressure on China to reform its economy and human rights record. As with many in Congress, several Bay Area representatives were waiting to be briefed on details of the deal before making a final decision. Rep. Anna Eshoo, D-Palo Alto, has been supportive of China's membership in the WTO and urged people in Silicon Valley to "weigh in and explain to skeptical members of Congress how this agreement will have a positive effect." But Rep. Pete Stark, D- Fremont, said he knows enough about China's history to realize the WTO deal is a bad idea. "China's not ready to enter into civilized relations with anyone," he said. Nancy Pelosi, one of the most ardent China critics in Congress, said she's also concerned about the deal. "Once they get permanent (normal trade relations status), all leverage from the U.S. on behalf of business is over because they have what they want permanently," Pelosi said. "They have violated their agreements in terms of proliferation of weapons of mass destruction, they have violated their agreements in terms of trade, they have violated their agreements on international covenants on human rights. Why is that we think they are then going to honor their commitments they make for WTO?" Feinstein said China's entry into the WTO would be good for the U.S. economy. "I think the American economy is much better off with China as a member of the WTO than it is with China outside of the WTO, doing whatever it wants whenever it wants to do it," Feinstein said. "I think the key to world trade is everybody playing by the same rules." The deal is specifically good for California, she said. "We're the largest exporting state in the nation. To be able to have fair terms and overall reduced tariffs, reduced market restrictions to our products, this is important. And it's important to do it now," she said. As China's economy grows and its people have more money to spend, they'll want to buy foreign goods, Feinstein said. California traditionally has looked to Asia for its export markets, she said, which was one reason why San Francisco formed the sister-city arrangement with Shanghai in 1979, the first such agreement between Chinese and American communities. And that deal, which brought mayors Feinstein and Jiang together, in a way, helped make the WTO agreement possible. Veering sharply from the positive tone he had set to date, Republican U.S. Senate candidate Tom Campbell unleashed an aggressive attack on his Democratic opponentMay 2000, charging Sen. Dianne Feinstein with concealing information that could show she stands to profit from an upcoming Senate vote on China trade. Campbell charged that Feinstein had failed to adequately disclose her husband's business interests in China. Feinstein's campaign responded that Campbell was simply wrong. The senator has properly reported all of husband Richard Blum's business interests, her campaign said, asserting that none of them any longer involved "mainland China." The campaign said Blum does have an interest in one company doing business in Hong Kong, which became part of China almost three years ago. At a news conference that was better attended than any other Campbell had held during his campaign so far, the Silicon Valley congressman charged that the financial disclosure report Feinstein filed with the Senate in 1999 "is grossly and curiously incomplete regarding the value of her China investments." Campbell said Feinstein had failed to list the value of 14 partnerships in which Blum, a millionaire investment banker, holds interests. References in the report to companies such as "Golden Asia," "Golden China" and "Shanghai Pacific Partners," Campbell said, suggest "a strong possibility" that Blum has interests in China. "Do you or your family have any holdings in China? Is a Chinese agency a partner in any investments? Do they stand to benefit from China's entry into the World Trade Organization?" Campbell asked. He offered no evidence of Chinese investments by Blum or potential benefits from actions Feinstein can take as a senator, saying it was impossible to know because of inadequate disclosures. But Kam Kuwata, Feinstein's campaign manager, said Campbell was wrong on all counts and his error was rooted in a fundamental misreading of the report. "I guess it's an honest mistake," Kuwata said. "He didn't read the instructions on the report." Campbell based part of his claim on blank spaces next to 14 partnerships where the value is supposed to be disclosed. But, rather than reporting the value of the partnerships, Feinstein, in fact, listed the individual assets belonging to each partnership and reported the values of each of those assets. investment in Hong Kong, but Kuwata said he did not have details on it. "Right now, that report is a year old. They have divested of any holdings in mainland China," Kuwata said. He also said the Senate ethics committee reviews the disclosure report every year and did not indicate it was in any way inadequate. "Instead of running around making these nonsense statements that aren't true, he should be in Washington representing the people of San Jose," Kuwata said. "He missed 40-some-odd votes over the last several days." Feinstein's report for 1999 was due to be filed with the ethics committee May 15, but the committee withholds such reports from public disclosure for about a month. With a critical vote on trade relations with China potentially reaching the Senate before then, Campbell said, Feinstein should release the report now. Kuwata said Feinstein would "abide by the rules of the Senate, not Tom Campbell." Sen. Dianne Feinstein, is married to the owner of Newbridge Capital Corp., Richard C. Blum, who has made many millions in very lucrative deals with the Chinese government. In 2009 some key Cabinet picks boded ill for Taiwan in its struggle fornindependence from Red China. Obama's intelligence czar, for one, doesn't think the key island democracy is worth protecting. In fact, Adm. Dennis Blair regards Taiwan much like the Chinese Communists regard it -- as a nuisance. His exact words are more colorful. At a late 1999 Capitol Hill meeting, Blair told staffers that Taiwan had become "the turd in the punch bowl" of U.S.-Chinese relations, as Bill Gertz reported in his bookn"The China Threat." If Taiwan were to declare itself an independent nation, Blair asserted, "I don't think we should support them at all." The remark was viewed by at least one Senate aide who attended the closed-door meeting as a clear sign that the Clinton administration had aligned itself with the communist regime in China against democratic Taiwan, an alignment that seems tonbe repeating itself with this administration. just two years ago, he wrote that "China is on a positive trajectory," despite amassing hundreds of missiles across the strait from Taiwan. He also argued that "the U.S. should offer to involve China in bilateral and multilateral military operations for the common good." Astonishingly, none of this was raised in an hours-long hearing on Blair's nomination as President Obama's national intelligence director, a post that will oversee a budget of nearly $50 billion across 16 intelligence agencies. In fact, Taiwan never once came up, while China was mentioned just twice, and only in passing. Why would senators have to keep such important questions private, when the fate of Taiwan could hang in the balance -- along with possibly Japan and South Korea, and potentially the entire Pacific island chain stretching to Hawaii? "There was originally this kind of anti-communist view of China," said Sen. Dianne Feinstein (D-Calif.), who in 1979 became the first U.S. mayor to visit China when she ran San Francisco. "That's changing. . . . China is a socialist country but one that is increasingly becoming capitalistic." Feinstein said the views of her colleagues have become more sophisticated with time. They know that China holds a massive amount of U.S. debt and that it imports a lot of goods -- $11 billion worth from her state alone last year. "I have never seen a country change as fast in 30 years as China has done," she said. Noted speakers included Senator Dianne Feinstein, Washington lobbyist Thomas Hale Boggs, Jr., former U.S. Trade Rep. Charlene Barshefsky, one of China’s foremost “America” experts Wang Jisi, and New York Times columnist and author Thomas Friedman. 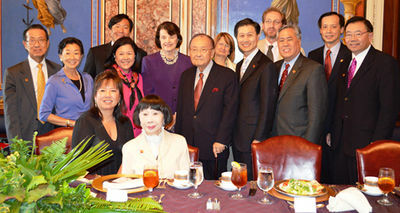 Committee of 100 Members Delegation at Senate Luncheon hosted by Senator Daniel Inouye, with his wife Irene Hirano-Inouye and Senator Dianne Feinstein. July 2012 Senator Daniel Inouye hosted a luncheon for the C-100 Washington delegation at the U.S. Capitol. In his brief and candid remarks, he recounted the historical experiences of the many Japanese Americans who faced discrimination and reflected on how similar prejudices are resurfacing against Chinese Americans in response to American angst over China's far-reaching economic power. He affirmed the Committee's efforts to mitigate anti-China sentiment in the United States by educating the American public on China issues and fostering people-to-people diplomacy between both countries. Despite her full schedule, Senator Dianne Feinstein took a rare moment to join the luncheon and speak about U.S.-China relations. The senator's insightful outlook based on her myriad interactions with the top echelons of China's leadership underscored the importance of strengthening trust in bilateral relations. The original drafter of the resolution was Wa'el Alzayat of EmergeUSA. This page was last modified on 13 April 2019, at 04:40.